Maker Of 'Body Cams' Used By Police Reports Spike In Sales : The Two-Way What's interesting is the spike started well before the August shooting of Michael Brown in Ferguson, Missouri. Washington, D.C., police officer Debra Domino wears a body camera at City Hall in September. Taser International is reporting a big jump in demand by police departments for "body cameras." The company, one of the biggest providers of body cams to police departments, says 2014 sales of its "Axon Body" model are up 300 percent over last year, and sales of its more expensive "Axon Flex" camera have doubled. And what's interesting is that this spike started well before the August shooting of Michael Brown in Ferguson, Missouri. "We were getting onesies, twosies, ten here and there in the first few years," says Steve Tuttle, Taser's vice president of communications. "And then in the last year, right before Ferguson hit, we hit this part where it was the fastest-growing market segment for the company. Then Ferguson hit!" This may be a measure of the longer-term pressures that police departments have felt to adopt this technology. 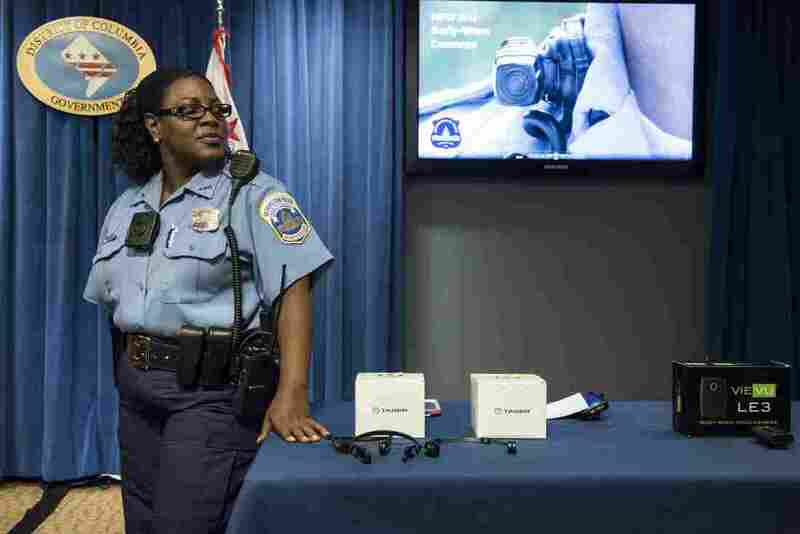 New Orleans bought cameras for all its patrol officers this spring, in an attempt to convince the Department of Justice that its police department has reformed itself enough to get out from under federal monitoring. Albuquerque is another troubled police department that has embraced the cameras. And last year, a federal judge ordered the New York Police Department to set up a body camera pilot program, as a remedy for constitutional abuses committed by officers practicing "stop and frisk." But the body cameras have not been a cure-all. In New Orelans, the independent police monitor has been repeatedly frustrated by the apparent non-existence of videos in incidents of alleged police brutality. Officers say they forgot to turn the cameras on, or they blame technical problems. And even though body cameras have become a popular rallying cry, post-Ferguson, most departments are still taking a wait-and-see attitude. The cameras cost upwards of $400 per unit, and the real long-term costs come over time. It's not cheap or easy for departments to manage the thousands of hours of video generated by the devices, and a big new source of revenue for Taser International is "Evidence.com" — essentially a cloud storage service that promises police departments greater simplicity in the management of this new "content."